The 13th Annual Tennis Against Breast Cancer Pro-Am was the most successful as nearly 100 people gathered in New York City the weekend of October 22nd. 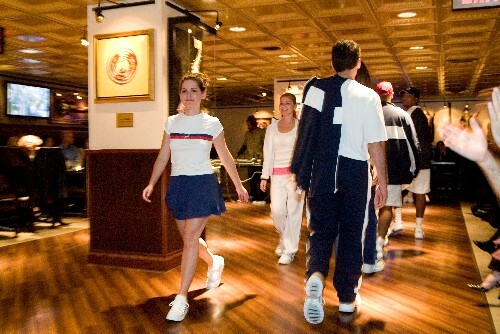 The kick-off was Saturday night with a TABC/Loriet Fashion Show at the Hardrock Cafe at Times Square. 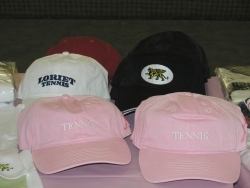 The show -- and Loriet's new line of tennis clothes -- was a hit with the crowd and it led into Sunday's Pro Am. The participants at Roosevelt Island Racquet Club included Davis Cup Captain Patrick McEnroe, All My Children stars Leven Rambin & Colin Egglesfield, former Princeton player and current author David Eaton and a host of local tennis professionals. Also joining the event exhibitions were top Eastern junior players Francine Whu, Manuela Velasquez, Malika Rose, Carlissa King, Laken King and Skylar Kono.. Nearly $9,000 was raised from the Pro Am and Silent Auction, with such items as a racquet signed by Andre Agassi and a hat signed by Martina Navritalova. All of the TABC events are organized and run by Maureen Rankine, who has dedicated herself to this cause for more than a decade.